(CNN) -- Lynette "Squeaky" Fromme was released from federal custody Friday, a spokeswoman for the U.S. Bureau of Prisons said. 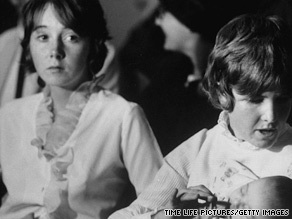 Lynnette "Squeaky" Fromme, left, appears in court in Los Angeles, California, in December 1969. Fromme was convicted in 1975 of pointing a gun at then-President Gerald Ford in Sacramento, California. She was released Friday morning from Federal Medical Center Carswell in Fort Worth, Texas, said Felicia Ponce, a spokeswoman for the U.S. Bureau of Prisons in Washington. Fromme, a follower of Charles Manson, pointed a gun at Ford a year after he became president. Secret Service agents prevented her from firing; the gun was later found to have ammunition in it, but no bullet in the chamber. In a 1987 interview with CNN affiliate WCHS, Fromme, then housed in West Virginia, recalled that the president "had his hands out and was waving ... and he looked like cardboard to me. But at the same time, I had ejected the bullet in my apartment and I used the gun as it was." She said she knew Ford was in town and near her, "and I said, 'I gotta go and talk to him,' and then I thought, 'That's foolish. He's not going to stop and talk to you.' People have already shown you can lay blood in front of them and they're not, you know, they don't think anything of it. I said, 'Maybe I'll take the gun,' and I thought, 'I have to do this. This is the time.' "
She said it never occurred to her that she could wind up in prison. Asked whether she had any regrets, Fromme said, "No. No, I don't. I feel it was fate." However, she said that she thought her incarceration was "unnecessary" and that she couldn't see herself repeating her offense. "My argument to the jury was, if she wanted to kill him, she would have shot him," John Virga, a Sacramento attorney appointed to defend Fromme, told CNN recently. Fromme was sentenced to life in prison, and parole was an option at the time, although the federal system later abolished it, Ponce said. Inmates do receive "good time" -- for every year and one day they serve, Ponce said, 54 days are lopped off their sentence.